Accessibility at Lanoue Chevrolet (Assistive Devices, Support Persons and Support Animals). Note: This Policy is in accordance with Ontario's AccessON requirements, and the Accessibility Standards for Customer Service, Ontario Regulation 429/07, under the Accessibility for Ontarians with Disabilities Act, 2005. Lanoue Chevrolet is committed to providing goods and services in a manner that respects the dignity and independence of persons with disabilities. The dealership will use reasonable efforts to ensure that the provision of goods and services to persons with disabilities will be integrated unless an alternative measure is necessary to enable a person with disabilities to obtain, use or benefit from the goods or services. Lanoue Chevrolet has a wheelchair available on site for use by persons with disabilities during their visit to the dealership, if required. Lanoue Chevrolet welcomes persons with disabilities to use their own personal assistive devices as may be reasonably required to access the services of the dealership. communication boards (used to create messages), and speech generating devices. a) Lanoue Chevrolet welcomes persons with disabilities who are accompanied by a service animal onto the dealership premises owned, which are open to the person with a disability. b) If the service animal is excluded by law in an area of the dealership (e.g. 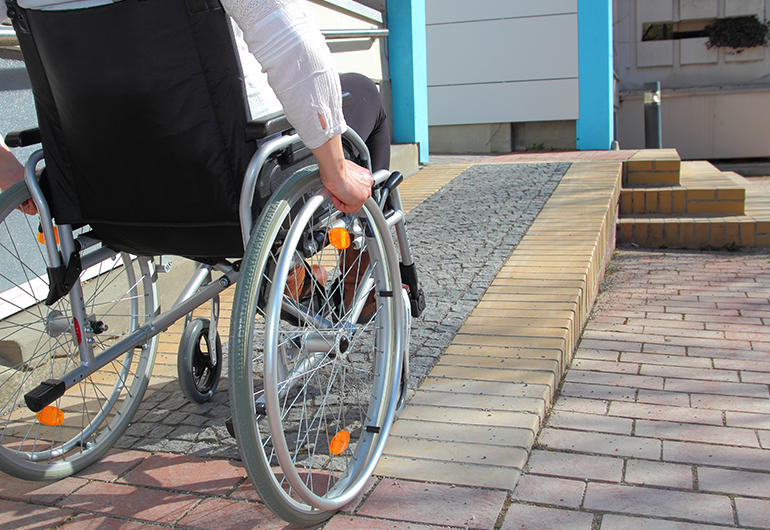 health or safety laws), the dealership will strive to use other measures to accommodate the person with a disability. c) Lanoue Chevrolet will also ensure that all staff who deal with the public are properly trained in how to interact with people with disabilities who are accompanied by a service animal. The dealership welcomes onto its premises persons with disabilities who are accompanied by a support person. The dealership may require a person with a disability to be accompanied by a support person if it is necessary to protect the health or safety of the person with a disability or the health or safety of others on the premises. Lanoue Chevrolet will provide notice in the event of a planned or unexpected disruption in the facilities or services normally used by persons with disabilities to participate in the activities of the dealership. A notice regarding a temporary disruption will include information about the reason for the disruption, its anticipated duration, and a description of alternative facilities or services, if available. The notice will be placed in relevant conspicuous locations on the dealership premises and, when appropriate, will be placed on the dealership's website, on the Accessibility page. ii) who participate in the development of policies, practices and procedures concerning the provision of goods and services to members of the public. b) Training will be provided on an ongoing basis and whenever there are changes to policies, practices and procedures. c) Lanoue Chevrolet will keep records of the training provided, including the dates on which training is provided and the number of individuals to whom it is provided. a) The dealership welcomes feedback regarding the provision of goods and services to persons with disabilities. Feedback may be provided in person, in writing, by email or by telephone. b) Lanoue Chevrolet will review all feedback it receives and respond to such feedback where appropriate based on the nature of the feedback received. – Lanoue Chevrolet Inc is committed to interacting, communicating and providing goods and services to members of the public that are based on the full inclusion of all persons with disabilities. We recognize people with disabilities may have different needs and we will in accordance with government guidelines, support the identification, removal and prevention of barriers for persons with disabilities. – As an employer, Lanoue Chevrolet Inc, believes in integration and equal opportunity for all individuals, and is committed to treat all people in a way that allows them to maintain their dignity and independence and contribute to their maximum potential. In accordance with government guidelines, Lanoue Chevrolet Inc will provide the facilities, processes, tools and training to create an accommodating and barrier free work environment. – A Multi-Year Accessibility Plan that outlines actions to prevent and remove barriers to accessibility and meet the requirements under the AODA. Modifications to this or other policies: Any policy of Lanoue Chevrolet Inc that does not respect and promote the dignity and independence of people with disabilities will be modified or removed. In 2005, the government of Ontario passed the Accessibility for Ontarians with Disabilities Act (the “AODA”). It is the goal of the Ontario government to make Ontario accessible by 2025. The Integrated Accessibility Standards Regulations (“IASR”) under the AODA requires that effective January 1, 2014, Lanoue Chevrolet Inc shall establish, implement, maintain and document a multi-year accessibility plan which outlines the organization’s strategy to prevent and remove barriers for persons with disabilities and to meet its requirements under the IASR. This multi-year plan outlines Lanoue Chevrolet Inc’s strategy to prevent and remove barriers to address the current and future requirements of the IASR, and in order to fulfill Lanoue Chevrolet Inc’s commitment as outlined in Lanoue Chevrolet Inc’s Accessibility Policy. Lanoue Chevrolet Inc is committed to interacting, communicating and providing goods and services to members of the public that are based on the full inclusion of all persons with disabilities. We recognize people with disabilities may have different needs and we will in accordance with government guidelines, support the identification, removal and prevention of barriers for persons with disabilities. As an employer, Lanoue Chevrolet Inc believes in integration and equal opportunity for all individuals, and is committed to treat all people in a way that allows them to maintain their dignity and independence and contribute to their maximum potential. In accordance with government guidelines and in a timely manner, Lanoue Chevrolet Inc will provide the facilities, processes, tools and training to create an accommodating and barrier free environment. We will continue to ensure staff is trained and are familiar with various assistive devices that may be used by customers with disabilities while accessing our goods or services. We welcome people with disabilities and their service animals. Service animals are allowed in those areas of our premises that are open to the public. If the animal cannot easily be identified as a service animal, documentation from a regulated health professional may be requested. A person with a disability who is accompanied by a support person will be allowed to have that person accompany them on our premises. Before deciding on allowing the support personnel we will consult with the person with the disability to understand their needs, consider health or safety reasons based on available evidence and then determine if there is no other reasonable way to protect the health and safety of the person or other on the premises. In the event of a planned or unexpected disruption to services or facilities for customers with disabilities Lanoue Chevrolet Inc’s management will notify customers promptly. This clearly posted notice will include information about the reason for the disruption, its anticipated length of time, and a description of alternative facilities or services, if available. The notice will be placed at the front entrance of the impacted LANOUE CHEVROLET INC location(s) as well as on any affected device(s). Efforts will be made to make alternate arrangement to continue to provide service to people with disabilities. Lanoue Chevrolet Inc will provide relevant training about the provision of its goods or services to persons with disabilities to all employees and volunteers who deal with the public or other third parties on their behalf. Training shall also be provided on an ongoing basis in connection with changes to this policy. This training is also part of the new hire orientation. Customers who wish to provide feedback on the way Lanoue Chevrolet Inc provides goods and services to people with disabilities can do so by phone, mail, email, or fax. All feedback will be responded to in a timely manner. Complaints will be addressed according to Lanoue Chevrolet Inc’s regular complaint management procedures. Upon request, Lanoue Chevrolet Inc shall provide a copy describing its feedback process. Existing processes for receiving and responding to feedback are accessible to persons with disabilities by various formats and communication supports, available upon request and in a timely manner. Lanoue Chevrolet Inc is committed to implementing a process to ensure that all employees, volunteers, all other persons who provide goods, services or facilities on Lanoue Chevrolet Inc’s behalf, and persons participating in the development and approval of Lanoue Chevrolet Inc’s policies, are provided with appropriate training on the requirements of the Integrated Accessibility Standards Regulation (IASR) and on the Ontario Human Rights Code as it pertains to persons with disabilities, and are provided with such training as soon as practicable. – Training is provided on any changes to the prescribed policies on an ongoing basis. Lanoue Chevrolet Inc is committed to making company information and communications accessible to persons with disabilities. Lanoue Chevrolet Inc will incorporate new accessibility requirements under the information and communication standard to ensure that its information and communications systems and platforms are accessible and are provided in accessible formats that meet the needs of persons with disabilities. Lanoue Chevrolet Inc is committed to providing and maintaining premises that respect the dignity and independence of persons with disabilities. Safety and Emergency procedures training prepared by Lanoue Chevrolet Inc is required to be reviewed before any individual has authorized access to any facility; Lanoue Chevrolet Inc Health and Safety policies include procedures for Emergency Preparedness. These can be made available in an accessible format. During a temporary disruption to the availability of Lanoue Chevrolet Inc. facilities and/or services, we will notify our guests of the reason for the disruption and its anticipated duration. To ensure effective dissemination of this information notices will be posted at public entrances as soon as practical. If alternate locations are available during the disruption, we will also include this information on public notices. This procedure applies to all employees, volunteers as well as anyone dealing with the public or other third parties on behalf of Lanoue Chevrolet Inc. in the province of Ontario. Notice of service disruption shall be posted at a conspicuous place on the premises. The exact location may depend of the type of service disruption and should be reasonable for the circumstances. The General Manager or Owner is responsible for posting the notice as soon as practical. – Existing processes for receiving and responding to feedback are accessible to persons with disabilities by various accessible formats and communication supports, available at the Contact Us section of Lanoue Chevrolet Inc’s website: other formats are available upon request and in a timely manner. – Notify the public about the availability of accessible formats and communication supports. Lanoue Chevrolet Inc will ensure all internet websites and web content on those sites under its direct control conform to the Web Content Accessibility Guidelines (WCAG) 2.0 Level A and increasing to Level AA as per the IASR requirements. – Web pages and web content have been optimized for accessibility, according to WCAG 2.0 Level A, for any new web content added after January 1, 2014. – Ensure any new web content posted to existing web pages and any significant refresh, after January 1, 2014 will comply with the WCAG 2.0 Level A requirements. – Develop new internet sites in accordance with WCAG 2.0 compliancy requirements. – Optimize all existing internet websites and web content to conform to WCAG 2.0 Level AA by January 1, 2021. Lanoue Chevrolet Inc is committed to fair and accessible employment practices that attract and retain employees with disabilities. This includes providing accessibility across all stages of the employment cycle. o Work with suppliers to ensure external Web pages are compliant with the Information and Communication Standards under the IASR’s requirements. – Where a selected applicant requests an accommodation, Lanoue Chevrolet Inc will consult with the applicant and arrange for provision of suitable accommodations in a manner that takes into account the applicant’s accessibility needs due to disability. – Inclusion of notification of Lanoue Chevrolet Inc’s policies on accommodating employees with disabilities in offer of employment letters. o Information that is generally available to employees in the workplace. – In meeting the obligations to provide the information that is set out in the paragraph above, Lanoue Chevrolet Inc will consult with the requesting employee in determining the suitability of an accessible format or communication support. Where Lanoue Chevrolet Inc is aware that an employee has a disability and that there is a need for accommodation, individualized workplace emergency response information will be provided to the employee as soon as practicable if such information is necessary given the nature of the employee’s disability. – Additionally, Emergency Response Coordinators are trained to manage and assist any disabled employees in their area of responsibility, and when required assistive devices are available. On an ongoing and regular basis, and as per the applicable terms of the IASR, Lanoue Chevrolet Inc will review and assess general workplace emergency response procedures and individualized emergency plans to ensure accessibility issues are addressed. Lanoue Chevrolet Inc will ensure that corporate policies surrounding accommodation and return to work are followed, documented and in compliance with the requirements of the IASR. – Lanoue Chevrolet Inc’s existing policies include steps that Lanoue Chevrolet Inc will take to accommodate an employee with a disability and to facilitate an employee’s return to work after absenteeism due to disability. – Lanoue Chevrolet Inc will review and assess policies to ensure that they include a process for the development of documented individual accommodation plans for employees with a disability, if such plans are required. ▪ Information that is generally available to employees in the workplace. – Identify any other accommodation that is to be provided to the employee. Lanoue Chevrolet Inc will ensure that the return to work process as set out in its existing policies outlines the steps Lanoue Chevrolet Inc will take to facilitate the employee’s return to work after a disability-related absence, outlines the development of a written individualized return to work plan for such employees, and requires the use of individual accommodation plans, as discussed above, in the return to work process.